Christmas Ornaments Made in USA - 2011 U.S. Supreme Court Winter Scene Ornament - A Christmas Ornament Co.
Likely the most beautiful Supreme Court ornament released to date, the 2011 ornament is unique for several reasons: it is full 3D, plated in 24 k gold and is built with small "feet" on it so it can be used not only as a Christmas tree ornament but also it can "free-stand" on a desk, table or mantle piece. 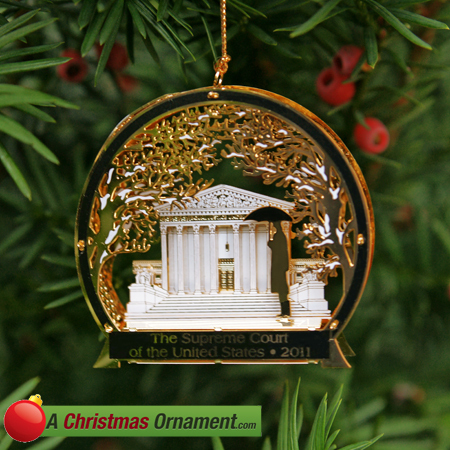 The ornament also features the facade of the Supreme Court building (again in 3D) in Washington, DC. The setting is a winter scene: there is a canopy of trees above the front of the building with branches lightly covered in snow and a lone man standing in front of the building with a black canopied umbrella. On the bottom front of the ornament are the words "The Supreme Court of the United States 2011."